This is quite a long post with some very dodgy photos and way too many of my bum – you have been warned! Well, these have been a very long time in the blogging. Once again (as always) photographs were the stumbling block. Someone recently (sorry but can’t remember who) mentioned that they often like garments better after having seen the pics and blogged them. I’m afraid that I am completely the opposite. The pants to follow are a very good example. I made them, wore them, was quite happy with them and then I saw the photos and went “Oh, they don’t look like they fit nearly as well as they feel like they fit”. I think that this is exacerbated by the fact that I have never seen close up views of me in RTW pants. And these makes certainly fit better than any RTW that I’ve had recently. But on to the Barbs. I got this pattern free and you can too by signing up for their newsletter here. According to their size charts I am between 16 and 18 in the hips but a 20 in the waist. Fortunately for this promo you receive the size requested plus one size either side. I ordered the size 18 and received 16, 18 and 20. So I made a first hopefully wearable muslin using a size 16 for the back and size 18 for the front. FYI I have comparatively small hips and a very flat bum. 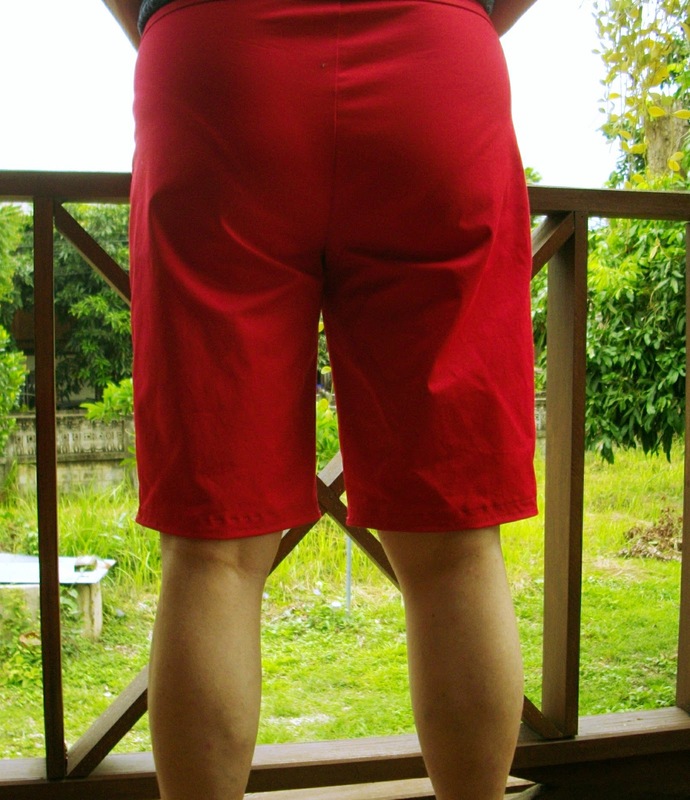 I used some very bright red cotton spandex. Which is fabulous fabric by the way, although very bright as you can see. So this is the back of the size 16 with no alterations. As you can see, there is clearly too much fabric at the top of the thighs. The front in an 18 was also too big. I have taken these apart to recut in a smaller size. 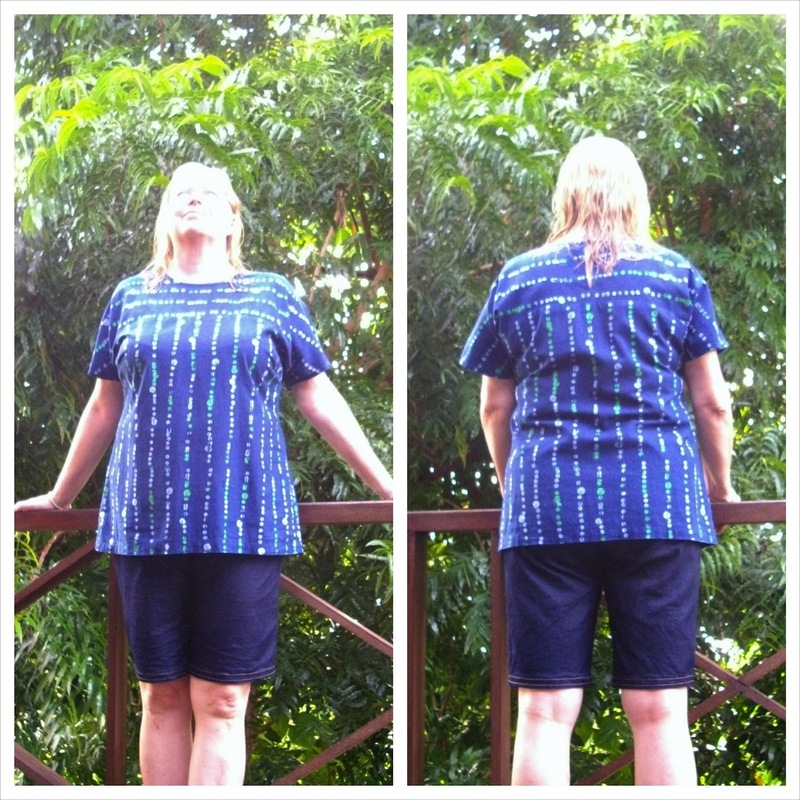 I then made another pair using size 16 both back and front using fairly light stretch denim. I made a flat bottom adjustment using Style Arc’s tutorial. I also took 1 cm out of the front crotch depth based one the many tutorials I found. I really can’t remember which one I finally used. Sorry, it’s hard to see details with dark colours but obviously they still need to have more fabric removed under my bum. And there’s still too much fabric in the crotch as well. However, these are in high wardrobe rotation and are very comfortable. And are usually only seen with a shirt out over them like this. 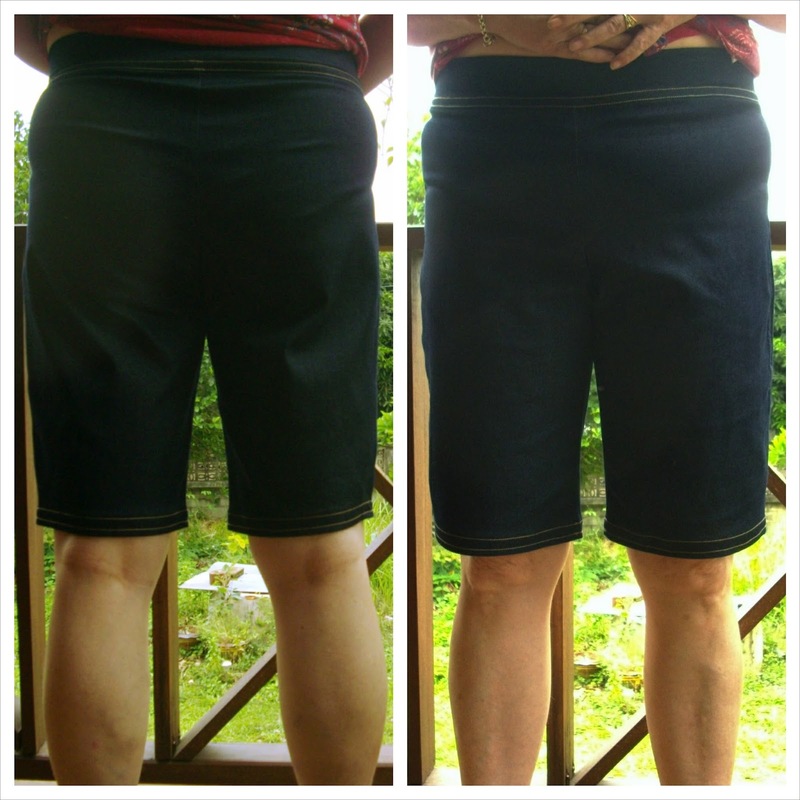 So then I made version 3 out of the same denim but decided to go for a capri length. I did another flat bottom adjustment (so I took out about 3 cm altogether) and took another 1 cm from the front crotch. I also basically removed the hip curve entirely and took a couple of centimetres off the outside leg seam. And there is still excess fabric. However, again these are in high rotation and very comfortable. Note that I was not/am not looking for a really close fit as it is much cooler in really hot, humid weather to have a slightly looser fit. This is also cheap stretch denim and doesn’t have great recovery, hence the bagging at the knees. And boy that top is too big and doesn’t have enough drape. But that’s a story for another day. I have since also made a pair of jeans using the size 16 Barb with yet more adjustments. So hopefully you’ll see those soon. I also now have the pattern in a size 14, which is probably what I should have started with! In fact this experience (and a few other things) distracted me while I did some research into pattern sizing, finished garment sizes and the information provided regarding choosing sizes. What I discovered quite surprised me. I hope to post that in the next day or two and I will be really interested in everyone else’s views on that. Well done for getting to the end of that. Your turn now. Have you tried Barbs? How did you get on? 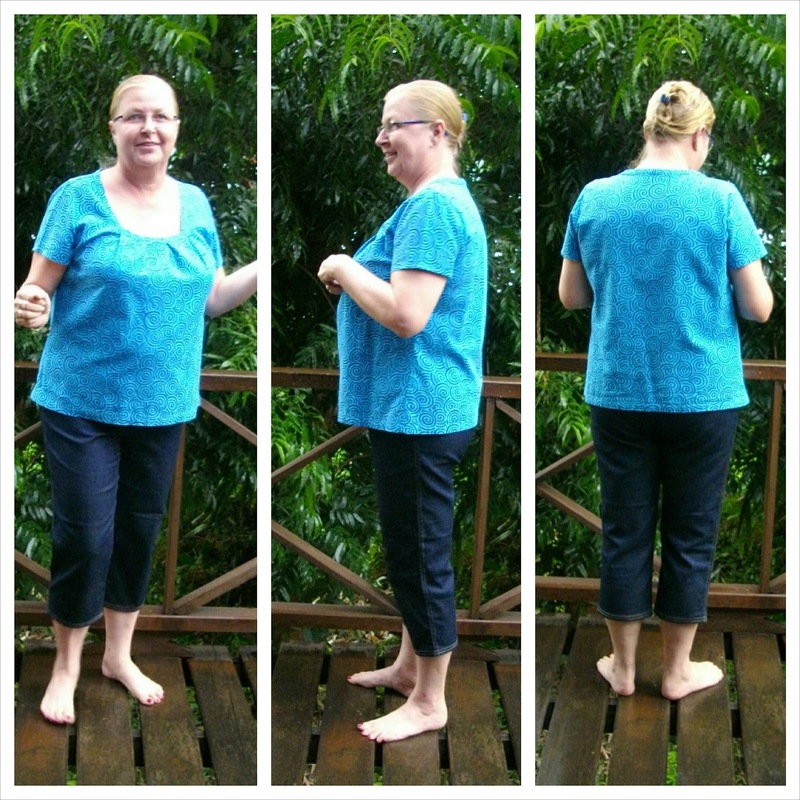 Thanks for posting about sizing – particularly StyleArc because I'd love to use more of their patterns but am not totally confident about choosing the best size. My latest post is wrestling with the Susan t-shirt but I am a newbie and not a fair barometer for their products. Looking forward to the next post. I like the capri length pants very much – excess fabric didn't seem noticeable. I have the freebie Barb, and its on my to-sew-soon list, but I haven't made them up yet. Going by my hip measurement, their Linda pants fit me pretty well right out of the envelope (I do have a very un-flat bum, though). I'm optimistic about the Barbs. You have made some great pants there. I can see the fit getting better with each version however all look great. Thanks very much. The capri pants are good. Yes, choosing the correct size is tricky especially given that Style Arc patterns are only one size. That's why I was so delighted with this offer. I'd highly recommend the Barb's though so give them a go while you can get the 3 sizes for free. Good luck with the Susan. I'm sure I read somewhere that the Barbs are based on the Lindas so you should be good with the Barbs. Good luck with them. Thanks BeaJay. I am pretty happy with them and I think the 14 should need very little tweaking. I have not tried the pattern, but I applaud you for not giving up. The fit gets better and better. The Barb was a disaster on me – I seem to have a pointy, triangular rear end, and there was nowhere near enough fabric in the crotch curve for me! The last pair look good on you, and I love the aqua top – you wear aqua nicely. Actually the crotch curve on this wasn't too bad for me. But I have just received the Flat Bottom Flo from Style Arc and I am really hoping that they might be a great starting point. Yes, I feel really good in that colour and it is hands down the colour that gets me the most unsolicited compliments from the most people. Must make an effort to get more.